Interestingly enough, apple trees through grafting can bear different varieties of apples on the same trunk. Was that too much for you? I didn’t believe it until dad showed me his espaliered apple trees. One trunk: different apples. I’ve seen that in viticulture, same deal – one hearty variety is for the stem and root while another varietal is grafted on for the grapes. These are not GMOs but methods passed down from farmers and agriculturalists. GMOs do not occur in nature. They happen in laboratories where scientists mix genes from unrelated species. Such as a bacterium gene into a corn plant. Making the corn we are to eat, a technical pesticide. On the ferry the other day I bumped into an Italian couple on summer holiday. We spoke about what every Italian can speak volumes about…. Can you guess where this is heading? Si Mamma mia! We spoke abouta foodah. They were complaining about the food here. I couldn’t blame them, there were chronically hungry or gastrically dissatisfied. They had just scarfed down a sandwich with GMO wheat and eggs from chickens raised eating GMOs, pumped with antibiotics, and treated inhumanely. Their coffee was so bad they had to put milk and lots of sugar in it. This is food that cannot be found in Italy. They brandished 5 packs of sugar to make their Canadian coffee palatable reinforcing their point. Italy requires mandatory labelling of GMOs. Recently Italy decided to ban GMO corn, citing loss of biodiversity by GMOs. Each region has its speciality; you cannot go 20 kilometers in any direction without encountering a different regional speciality. Later munching on a slice of (organic) pear from my uncle’s tree in Vancouver, I thought about this. If diversity is the spice of life, supermarkets in N. America are dull indeed. Bland. Blah. Even though they are vibrantly coloured, squeaky clean and blemish free, the vast majority of fruits are not natural. Even if not GMO, they are grown with toxic pesticides and herbicides and fungicides which leave residues in and on the food we are to it. Natural is the most misused label out there in the supermarkets today. A food can be called “Natural” and have GMOs and toxins. I’ve heard tell of a class-action lawsuit going after these corporations looking to unduly profit from the word Natural. Good. This deception must end. Natural is the pear I was eating. It was a little grainy, had a bunch of discolouration and dark remnants of some kind of pest that had burrowed into the core partway. I just cut that all off and enjoyed the unique flavour. It wasn’t the most exciting pear I’d ever eaten. Nor the most delicious. But it was sweet. And it was different. I can only eat a pear like this every year or when this tree bears fruit. It’s special. The ordinary miracle of real food. Grown without toxins. It made my day. 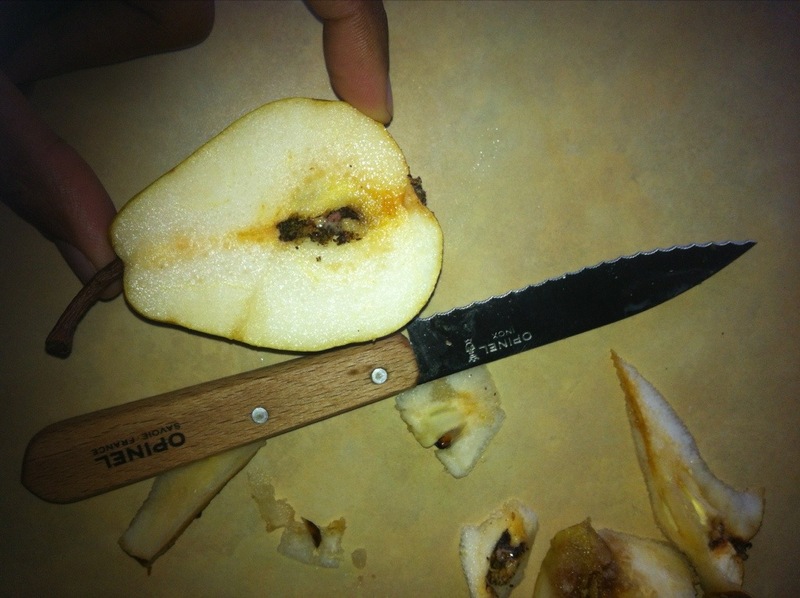 This entry was posted in Food heros, Mobilize and March, Organic, Right to Know and tagged Apple, Genetically modified organism, Italy, Pear on August 30, 2013 by Gurdeep Stephens. Food for planet and people…not just short term profits!